Getting a big apartment for a price that is in your budget can be hard, especially in the city. But little do you know that you can save money on rent and make a huge apartment with the space you have. 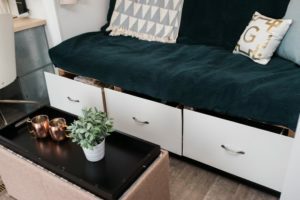 I will show you eight genius ways to utilise your small space so you can be more comfortable while having a fabulous decor. 1. Use fewer furniture: By using less furniture, you will be able to have a bigger space that you can utilise for something else. Having too many pieces of furniture can make your room smaller and look cluttered and busy. 3. Utilise the space under the stairs: Stairways can be transformed into almost anything. It is a great option to think about when you want to maximise your space. This bar just makes this design complete. 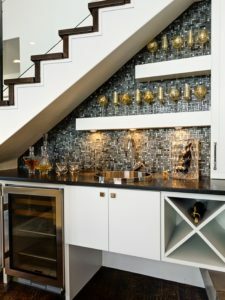 Who wouldn’t want to have room for a bar? Well, I do. Not only does this takes minimal space its convenient, classy and compliments the decor. 4. Utilise spaces underneath counters: In your bathroom and kitchen tend to have countertop spaces that you can utilise. 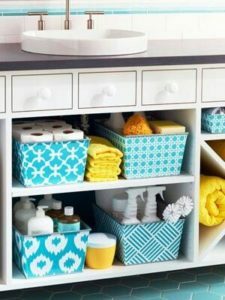 By installing selves and using baskets with proper organisation, you can’t go wrong. 5. Use sliding walls instead of doors or dividers: My apartment is a one bedroom without a door, so when I have guest over it kinda makes things a bit awkward. By using a divider or sliding door, which thank God I use. Will diffidently give your privacy and more freedom to transform the extra space into something else. 7. Add shelves: This is the most used method when thinking about space. 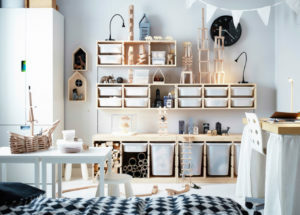 Shelves are easy, organised, convenient and outa the way. With selves, you have endless opportunities for your room space. 8. Change your furniture arrangement: Not organising your furniture base on the length and width of the room will most certainly throw off the design and make your room smaller and less spacious. Take a look at this, with the shape of this room its best to make the bed horizontal and other furniture vertical. By using shelves, baskets and utilising the bed as storage totally transformed this tiny box into something beautifully and spacious. By just working with the layout of your apartment you can customise it and transform it into anything you want with a little work of course. Let me know what you think and please drop a comment down below, by telling us some of your hacks for small spaces.